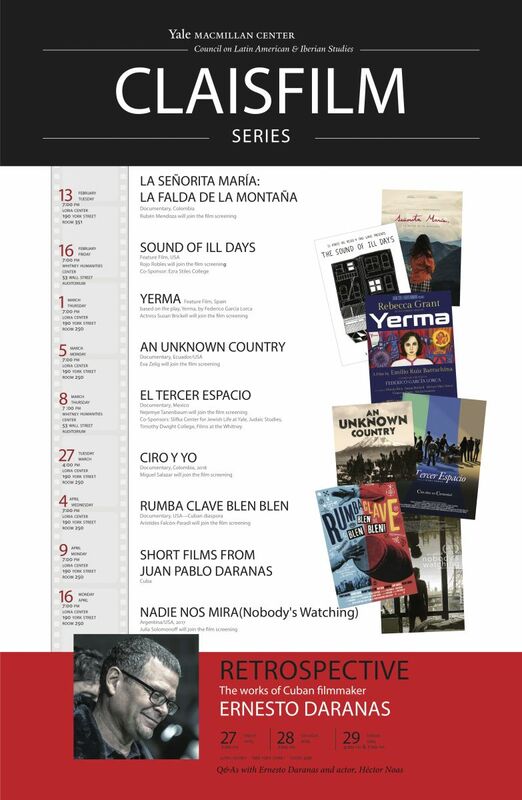 Retrospective of the works of Cuban filmmaker Ernesto Daranas. All films have English subtitles. Free and open to the public. His filmography includes Los últimos gaiteros de La Habana (2004), winner of the International Journalism Award Rey de España; Los dioses rotos(Fallen gods, 2008), Cuba’s nomination for the Oscars and award-winner at several international film festivals; Bluechacha (2012), Latin Grammy® Nominee for Best Long Form Music Video and Conducta (Behavior, 2014), Cuba’s nomination for the Oscars and winner of over fifty awards in American, Asian and European film festivals and Sergio and Serguéi (2017)winner of the Audience’s Choice Award at the 2017 Habana Film Festival. Q&As with filmmaker Ernesto Daranas. Laura (35 years old) is a university professor who prepares her master’s thesis on the famous Cuban pimp Alberto Yarini and Ponce de León, shot dead by his French rivals who controlled the prostitution business in Havana at the beginning of the 20th century. This visually rich and imaginative production takes us behind the scenes of “Bluechacha,” the last album recorded by guitarist, composer, and director Manuel Galbán (1931–2011), who also founded the quartet Los Zafiros. Produced in collaboration with Galbán’s daughter, composer Magda Rosa Galbán, and her husband, musician Juan Antonio Leyva, the film shows the three of them at work on the album, interspersed with dramatic sequences that tell a love story related to the music. Receptionat Loria in honor of Ernesto Daranas from 5:30 to 6:45pmon Sunday April 29th. Sergio (Tomás Cao) is struggling as a university professor to support his mother and sweet young daughter; he also enjoys being an amateur radio operator who has conversations with fellow enthusiasts around the world in particular an American conspiracy theorist (Ron Perlman). The Cuban makes a surprise contact with a cosmonaut named Sergei (Héctor Noas) who is stuck in outer space resulting from the collapse of the Soviet Union in 1991. All films have English subtitles and feature a discussion with the filmmaker following each screening. All events are FREE and OPEN to the general public!